Yesterday I shared the progress our crops have made in the green house during it’s debut season. You may have spotted a unique strawberry planter in the background of several of those shots. Today, I’m giving you a closer look at how those went together and are performing. 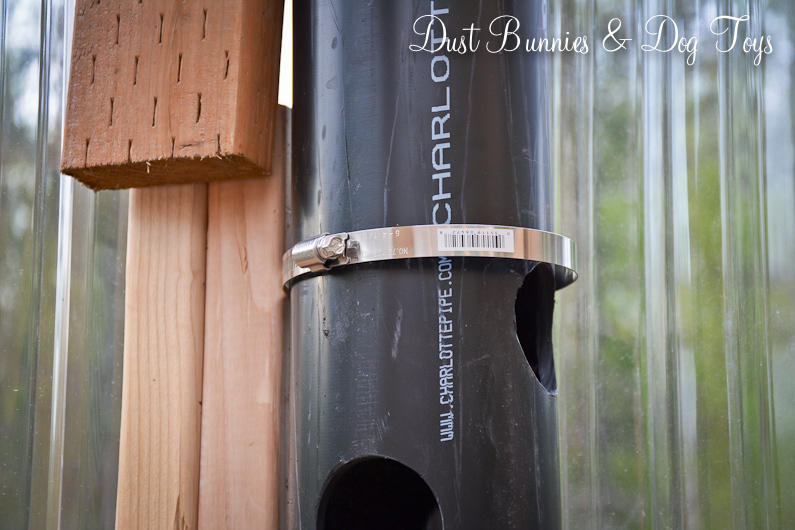 We started with a simple 4″ black pipe that the Hubs added a cap fitting to one end and drilled holes in on one side. 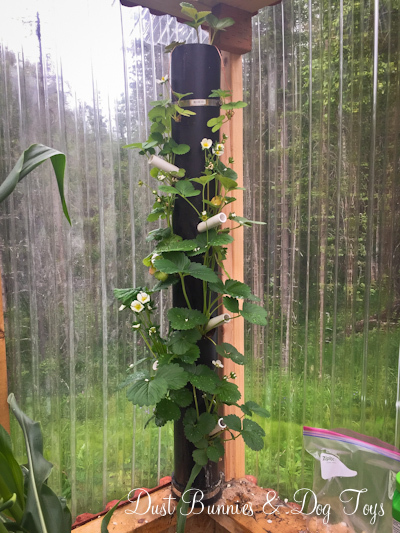 He then fastened them in the two corners of the green house where we don’t have the hydroponic shelves using simple clamp bands. 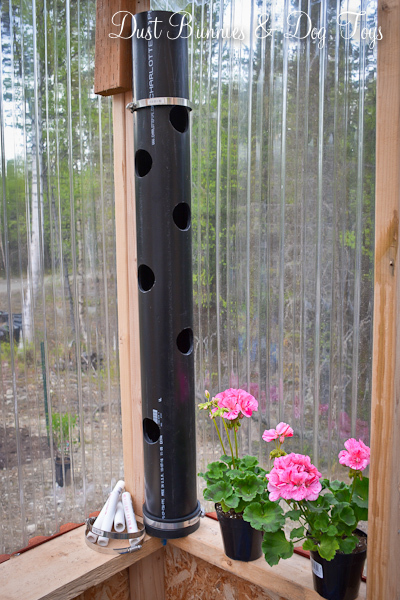 Here’s how they looked after they were put together and installed in the green house. He kept the bands loose enough that I could still pull the tube back out to plant it, which sure made planting them much easier! I love that they don’t take up any floor space in the green house. Their placement on the wall in the corners make great use of an awkward space that wouldn’t work for other crops. And it keeps the berries from sitting on soil where they could spoil as they ripen. Once they were planted I realized I needed a way to water each hole of the planter without washing away the dirt each time. 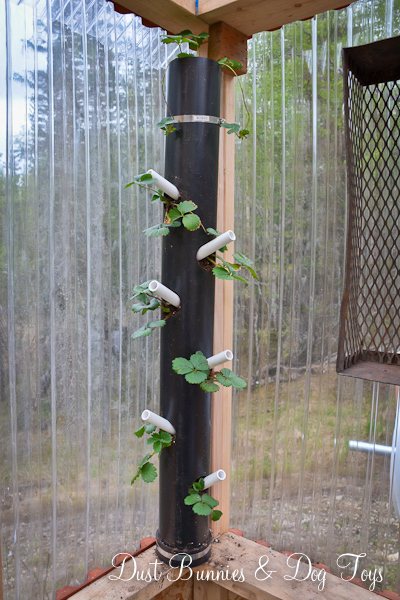 I’d seen several versions of these planters on Pinterest where they placed a second smaller pipe with drain holes along it’s entire length inside the large tube so water would seep out along the path of gravity. I’ve tried this system before with other set-ups and not had great luck so I decided not to go that route. 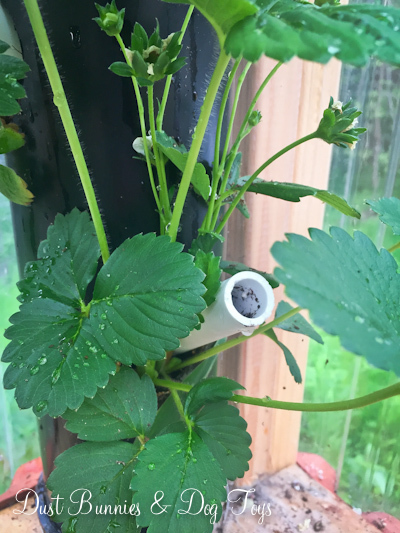 Instead the Hubs helped me create what I dubbed ‘strawberry straws’ – simple PVC pieces tucked into each hole near the roots of the plant. They were super noticeable at first when the plants were small, but as they’ve grown the white ‘straws’ start to blend in with the flowers on the plants themselves. And as you can see they are working great! 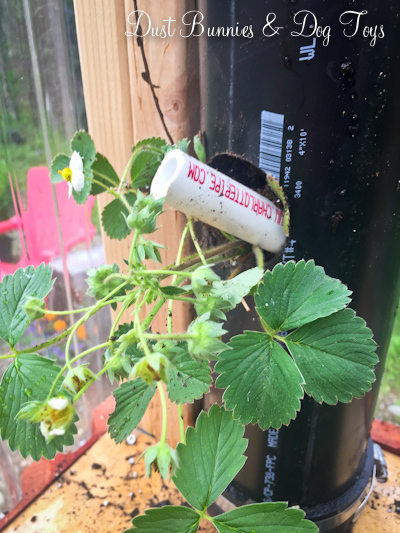 We’ve now got two of these vertical planters in the corners filled with strawberries and are starting to see blooms which give way to the developing fruit. Hopefully we’ll have an edible crop to enjoy very soon!